Once a month, Grand Oaks of Jensen Beach prints a community newsletter, the Grand Oaks Leaflet, for our residents and their families to enjoy. Each newsletter includes a current calendar of activities and a featured article about one stellar employee and one cherished resident. Be sure to subscribe to our monthly newsletter so you won’t miss your loved one in the Grand Oaks Leaflet! 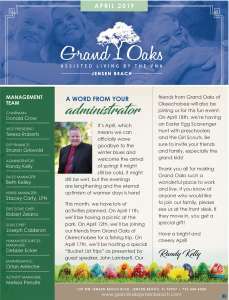 Sign up to receive the Grand Oaks Leaflet monthly in your inbox!